Reality is starting to sink in. School is starting. Soon. For some of you, school has already started. For others, you'll be soaking up summer until Labor Day has come and gone. Or, maybe you teach outside the U.S. and are currently in the middle of your school year. Whatever your situation, I want to invite you to join in #Teach180 this year. 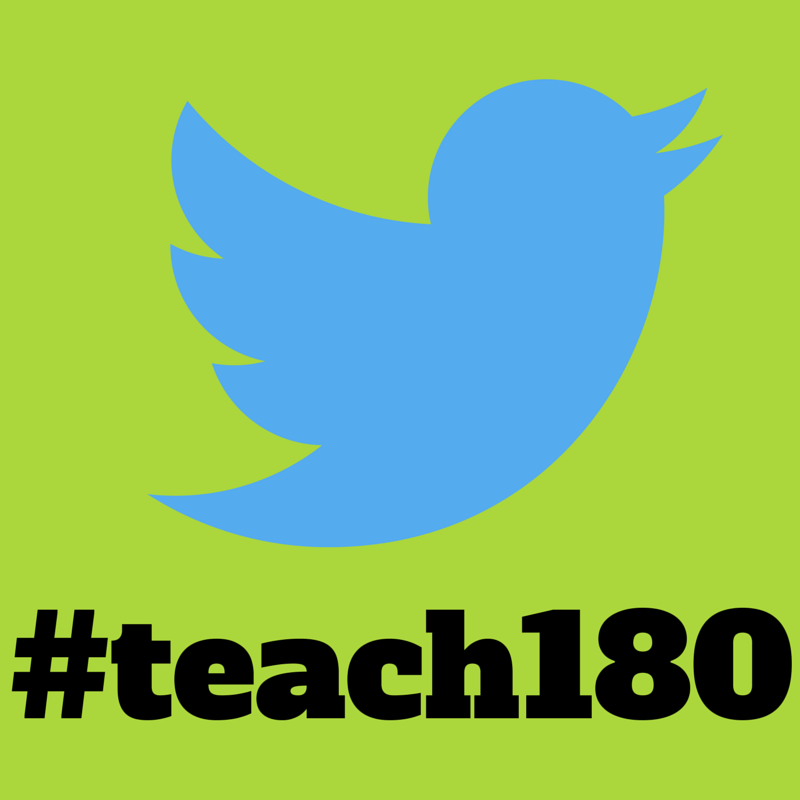 So, what is #Teach180? Let me give you the history of how this hash tag came to be. For years, many bloggers (in the MTBoS and outside of it) have kept 180 blogs. The idea behind these blogs is to write a short post each day containing a photo of one of the day's activities with a short description. Though I've always liked reading these 180 blogs, I knew that there was no way I could commit to writing a blog post every single day. Some of you may be thinking "Sarah, but you do often blog every day." Except I don't. Usually, when you see me go on an every day blogging streak, many of those blog posts have been written on the same day and scheduled to post so it *looks* like I'm blogging every day! Two summers ago, I decided I wanted to take the general idea behind a 180 blog and turn it into something that would work for me. I was also wanting to become more involved on Twitter, so I decided to smash 180 blogs and twitter together. This produced the #Teach180 hash tag. You can read my very first post introducing the idea of #Teach180 here. The experiment has been a success! I love taking the time to make a short daily reflection in 140 characters or less. Taking lots of photos means I have photos to insert into blog posts later! And, I've achieved my goal of getting more involved on Twitter! The idea is simple. Take a photo of a classroom activity each day. Post it to twitter with the #Teach180 hash tag. Need inspiration? Do a quick search of the hash tag to find hundreds of creative and innovative ideas. Over the years, #Teach180 has developed into a community of its own. Participants love to see what other participants are up to. I've been so encouraged by the comments and "likes" from other #Teach180 participants. Have you been looking for a way to interact with the #MTBoS? Have you been convicted to #JustPushSend? Do you want to start using Twitter but are too scared to just jump into a conversation? #Teach180 is a great way to get started! If you are interested in participating via blog instead of twitter, Julie has a great how-to post. Or, maybe you prefer Instagram to Twitter? Quite a few people have decided to post on Instagram with the #Teach180 hash tag this year. They'd love to have you! Really, it doesn't matter if you're opening your classroom to the world via a blog, twitter, or instagram. Just do it!